Isles Seeking Volunteers - November 29! The Community Service Committee received the message below from the Isles volunteer coordinator. If you can help, please email Arlen Hastings '80 at hastings@ias.edu. **An opportunity has come to Isles on short notice. To support improved energy efficiency in Trenton households (benefiting both the environment and families' budgets), we will support the free distribution of high-efficiency light bulbs. A door to door mass distribution of compact fluorescent light bulbs is planned for Saturday November 29 from 10 AM to 2 PM. We need volunteers to help. If your group can help please let me know. Any healthy adult (and children with supervision) can participate. Mark your calendars! The next opportunity for alumni and students to participate in a mass construction project at Isles will be Saturday, January 10, 2009. We will work indoors in a heated area. More information will be posted here and an invitation will be emailed in mid/late December. It's rewarding, fun, and a great way to burn off those extra holiday calories! PA3 Survey: Make your opinion count! Help make PA3 the club for YOU. Please complete a short survey to tell us what types of events and activities you would like to see as part of the PA3: the survey includes various types of social events, career networking events, community service projects, activities supporting students on campus, cultural events and much, much more! You can even volunteer to organize these events. The PACE Center has organized a "Fridays at Noon" program where alumni have informal (brown bag) lunches with undergrads and talk about their careers in public service. The program starts Friday, November 7. Area alumni who would be interested in sharing their experience with their own careers in public service with Princeton students should contact Arlen Kassof Hastings '80 at hastings@ias.edu. Other Friday dates to follow. Thank you to all of you that came out to the Little Tigers Playdates this fall. I made some new friends, and the children seemed to be having fun! The outdoor playdates will resume in the spring. I am looking into indoor locations for the winter and will post the dates and locations as soon as I know them. 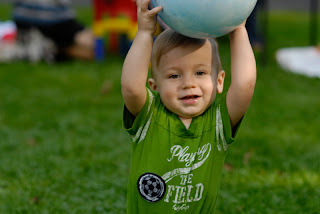 In the meantime, feel free to browse the pictures of the September Playdate - a gorgeous fall day. By the way, the child model seen in the photo is Benji, son of Jeremy Kestler '94 and Lisa Picken Kestler '96.